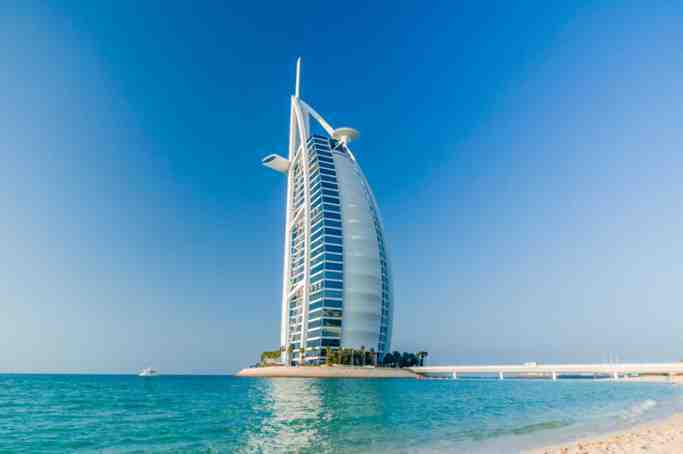 - During the below Islamic holidays / month ,there will be a restriction on live entertainment ( Belly dance , Tanoura dance) and serving alcohol throughout the UAE. Therefore the Safari will be operated without these entertainments and serving of alcohol at the camp site during these days. 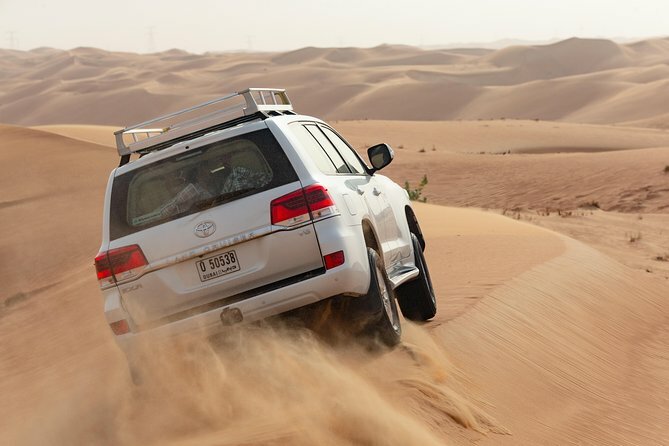 After a pickup from your centrally located Dubai hotel, relax in an air-conditioned 4x4 vehicle as you head to the desert that surrounds the city. Admire views of the barren yet enchanting landscape on the way, and listen to your guide’s tales about the region and its fascinating geology. First stop on your desert rendezvous is a traditional camel farm to see herds of the magnificent hump-backed herbivores. After showing off your balancing skills on a camel ride around the enclosures, learn about the different types of camels that are commonly seen in the desert around Dubai. Continue by 4x4 across the desert plains to the campsite in the desert and try your hand at a popular local pastime: sandboarding! Learn to master the art of 'surfing on sand' and race your friends and fellow travelers down the sand dunes during in an adrenaline-rushing experience. Show off your balance skills on a camel ride or relax and take a seat outside to watch your show as the sun sets over the craggy canyons and sun-baked plains. Get a henna tattoo design on your hands or feet, watch a traditional tanoura folk dance, and feast on a delicious barbecue dinner or try out our new shawrma station. Why not upgrade to a Exclusive Dubai Desert Safari by enjoying yourself at the shawrma station or indulge into a delicious barbecue dinner at your exclusive table with a bottle of sparkling wine & fruit basket. After dinner, smoke a shisha (Arabic water pipe), if you wish, and watch a live belly-dance performance around the campfire. Relax under a canopy of twinkling stars and enjoy an experience that could be straight out of One Thousand and One Nights! Your tour then finishes with a drop-off at your Dubai hotel. Really fantastic day made even better by our driver, Jaffa. Fun from start to finish. Great trip for our 8 year old on her first trip to Dubai. It was a great experience and we enjoyed a lot. Food and desert was also nice. It was a well organized trip. Great trip .. picked up from hotel and driven to desert ... driver was a "mad hatter" and gave good value (obviously confident with his vehicle). Dinner and entertainment was a bit of a let down, but didnt spoil the trip. it was a funny experience, the best thing to do in Dubai. Obviously very much organised for tourists but all in all a very good experience that i strongly suggest to everybody. The price of merchandise at the shops in the camp is too high. From pick up from the hotel lobby to return the most amazing tour. Driver Nur was extremely competent ensuring our safety but providing thrills on the dunes. The camel, falcon experience through to the endless shows continued to surpass so much enjoyment. The entire trip, hospitality and wonder truly the most amazing and great value. A must do! Fun evening. Well organised. Recommend the private couples table as we had our own reserved table and everything was brought to us. The staff looking after us were wonderful and couldn’t do enough for us. Only disappointing thing was the USB stick you can buy with your photos on included everyone else’s photos as well. Only other thing and this was nothing to do with the tour company, we were sharing a vehicle with a family of four and they showed no enthusiasm at all while in the vehicle. If I did this again I would try and get our own vehicle and not have to share! being in dubai felt like i hadn't left New York, but when we went on this trip we had a really good time. the came on time to pick us up, our tour guide was wonderful and made sure we had a blast with the dune. food was delicious.